A curious rabbit gets lost in the woods. Little Rachel was on her way home from her grandparent's house when she came across an egg lying on the ground. This egg was unlike any Rachel had ever seen before. It was white with enormous black polka dots; it was a very strange egg indeed. Rachel picked up the egg between her paws popped it into her basket and cheerfully hopped towards home. Hop hop hoppity hop, pleased with her new discovery Rachel failed to notice the trees in this area were different to the ones she had passed earlier. Suddenly, it began to rain, huge drops of water made a splish and splash sound all around her. "Where am I ?" cried Rachel moving in circles, clearly lost. The rain fell harder, Rachel knew she had to look for shelter, her fur was wet and she shivered from the cold. Hop hop hoppity hop, went Rachel not quite as happy as before, the trees were getting taller and scarier until they all towered high above her. Up ahead she could see a shape; she brushed the water from her eyes; it was a house. "I'll certainly find shelter there". Looking up at the big house with its large windows and gigantic door, Rachel thought this must be the home of a very tall somebody - that's for sure. Rachel knocked on the door but there was no answer. It was already slightly ajar so she pushed it open with all her might. Rachel hopped into the house, shook the water from her fur and peered into the darkness. She could hear a faint noise and hopped further along the corridor following the sound until she came to a room. The room was dark too and the unusual sound continued, Rachel was afraid but also curious. She moved past a table; the sound was stronger now. She ever so slowly and gently opened the cupboard, trying not to shake with fear. Inside was a sight that Rachel would never forget: a most peculiar looking creature, the size of a tree doubled over in the tight space. With small dots for eyes, a tiny round mouth and pointy ears. Enormous black polka dots covered its white furry body and teardrops rolled down its face. Rachel staring up at the unusual creature and feeling quite brave spoke "hello excuse me, why are you so upset?" the creature stopped crying and looked at Rachel noticing her for the first time. 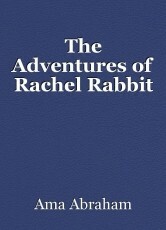 Rachel quickly backed away and squeezed her eyes tight thinking she was going to be eaten alive. Instead it began to speak " I went for a walk in the woods today and I lost my egg". Rachel instantly remembered the egg she had been carrying "you mean this one?" and handed the egg over to its rightful owner. "Yes" said the creature clearly overjoyed and relieved thank you, thank you so much!" now out of the cupboard it bent very very low and hugged little Rachel. "I have to go now" said Rachel smiling no longer afraid. Hop hop hoppity hop, away from the dark cupboard, dark room, dark house and dark wood until she was finally home. Hi Bill, thanks for your comments i'm glad you enjoyed it, I never thought about the creature helping Rachel I might add that in. This page was created in 0.4412 seconds.